Hamilton treated unbound paper-based materials including prints, drawings, and manuscripts. 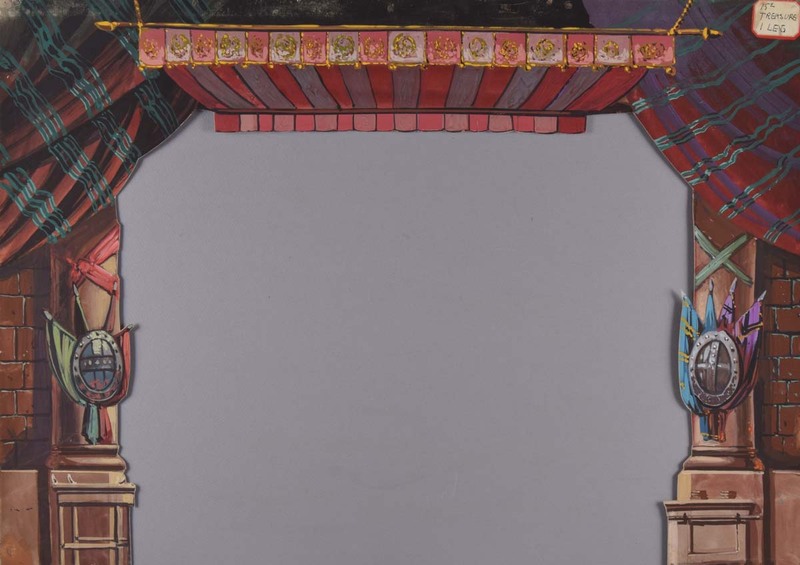 The exhibition Alice’s Adventures in Wonderland features two 1933 toy paper film strips called Movie Jecktors. 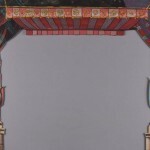 The film strips portray two of the most memorable parts of the Alice story: “Down the Rabbit Hole” and “The Mad Hatter.” Images and text are printed in three colors on 35″ strips of translucent paper. The strips are rolled onto wooden dowels and stored in colorfully printed little boxes. 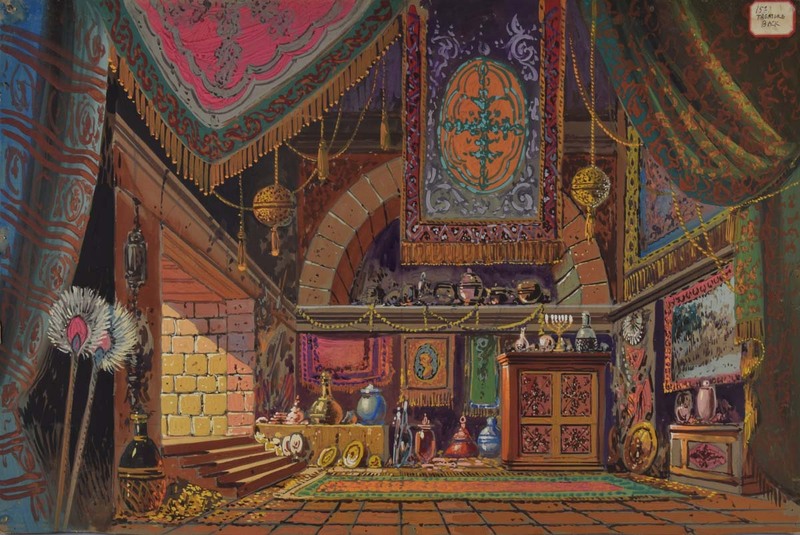 The Movie Jecktors would have been used with a toy film projector to create a simple animation. 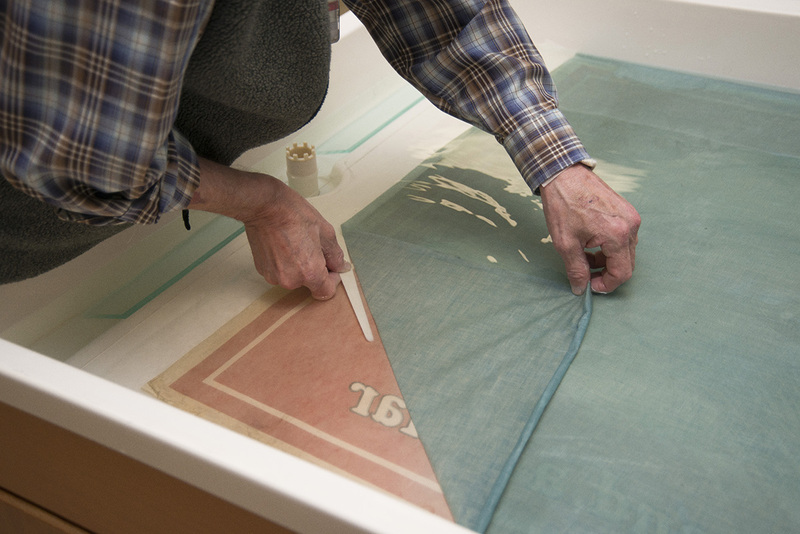 The Ransom Center’s Movie Jecktors required conservation before they could be safely displayed in the galleries. Both the wooden dowel and the storage box, which is made of wood pulp cardboard, had a high acid content. An acidic environment is harmful to paper. The Movie Jecktors had become brittle and discolored, and there were many tears and losses to the paper. 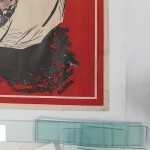 The film strips had been repaired in the past with pressure-sensitive tapes (the common tape we all use to wrap gifts). These tapes are never appropriate for repairing paper that we hope to preserve because they deteriorate and often darken over time and are also difficult to remove once in place. As the Ransom Center’s paper conservator, I removed the tapes using a heated tool and reduced the residual adhesive using a crepe eraser. I mended the tears and filled the losses using Japanese paper and wheat starch paste. For the fills, the Japanese paper was pre-toned with acrylic paint to allow these additions to blend with the original paper. Areas of ink loss were not recreated. 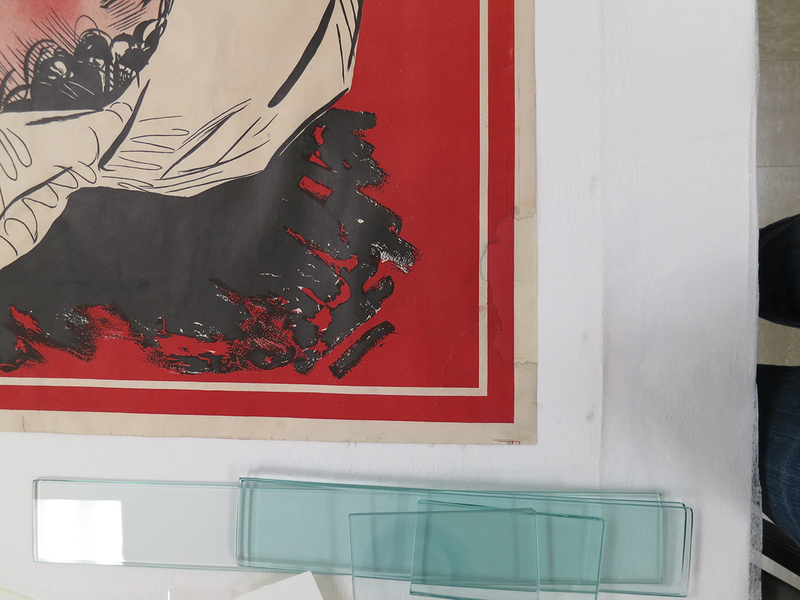 Visitors to the exhibition can see the areas of the filmstrips that were damaged, but those areas are now stabilized and less distracting. This kind of treatment reflects the practice of conservation to preserve, but not “restore,” the object’s original appearance. Libraries, archives, and museums today often choose the conservation approach because it allows researchers and other visitors a better understanding of the object’s history, including damages that occurred, which may speak to the materials used in the object’s creation. 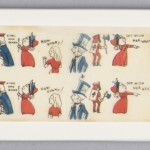 “Alice and the Mad Hatter,” Movie-Jecktor paper film strip, Dandy Films, 1933. 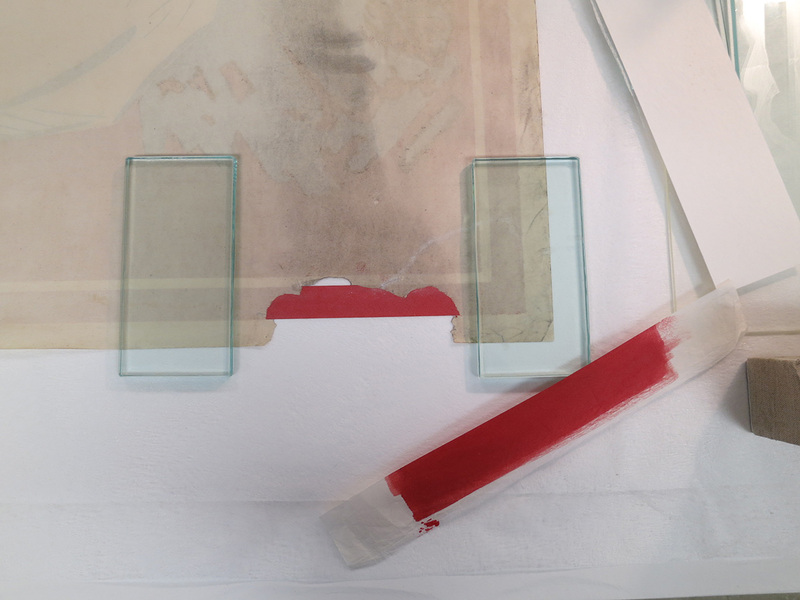 Prior to treatment by the Ransom Center’s conservation lab. 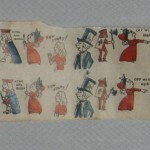 “Alice and the Mad Hatter,” Movie-Jecktor paper film strip, Dandy Films, 1933. 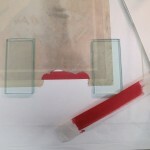 Treated by the Ransom Center’s conservation lab. 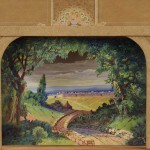 The performing arts collection at the Harry Ransom Center includes a remarkable set of theater backdrops, all in miniature. 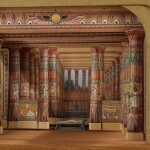 This collection of 112 backdrops, along with other free-standing scene elements, depicts grand symbolic imagery: Egyptian landscapes, biblical imagery, grand architecture, and even catacombs. 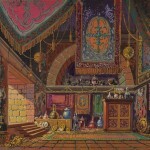 These scenes were created to support the theatrical rituals, or degrees, of the Scottish Rite of Freemasonry. But why are they miniature? 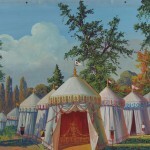 The model-sized drops were used by a salesman to market stage scenery to Masonic temples, and the small size allowed for ease of transportation. 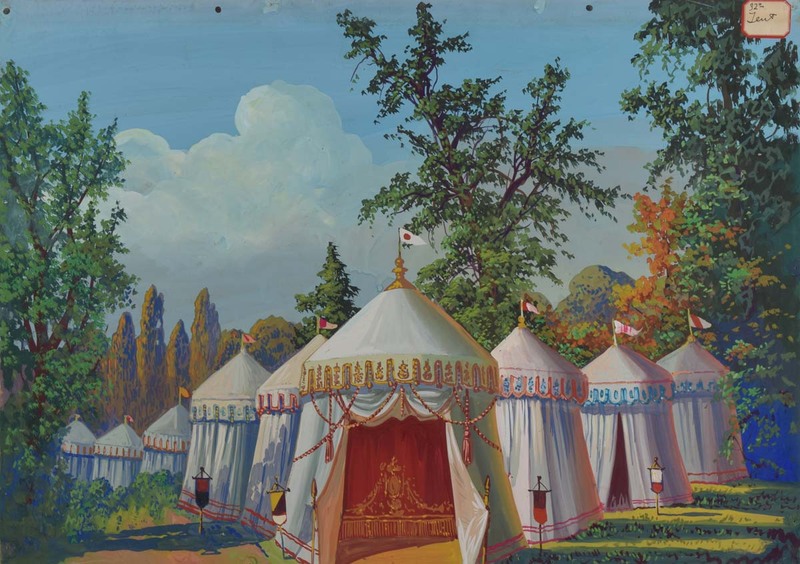 The model—and the corresponding full-sized scenes—was produced around 1900 by Sosman & Landis Studio, specialists in scenic art. The drops are painted in gouache onto paper illustration board. 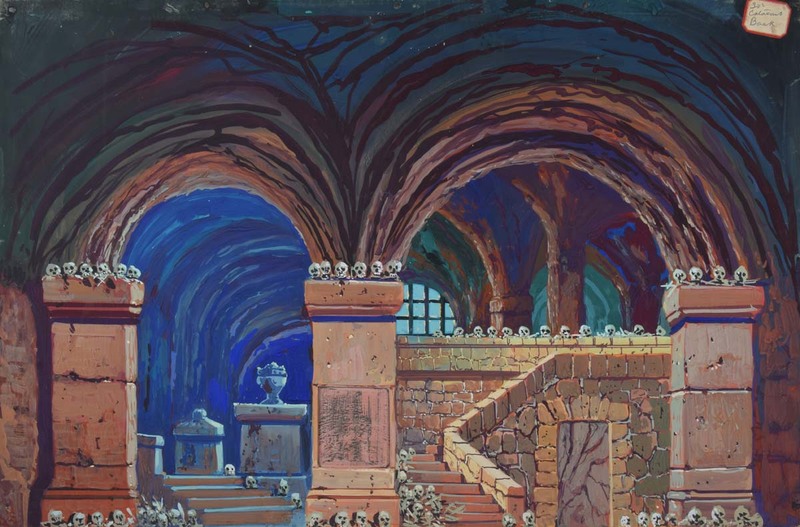 Some of the paperboards are cut to resemble “cut drops” and “leg drops,” scenic drop elements used further upstage from the backdrop to create depth of field for the audience. The collection is housed in a wooden travel trunk. Each drop has a wooden slat nailed along its top edge, and this slat allowed the drop to hang from two rails secured into the trunk. Because the drops were packed fairly tightly together in the trunk, they suffered damage over the years. To remove a drop, it had to be pulled up and out of the trunk, dragging against the adjacent drops in the process. 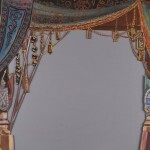 This caused breaking of the sometimes-complex paperboard cutouts as well as rubbing and scraping of the paint layer. Many of the drops became partially detached from their wooden slats, and all were dirty from many years of settling dust and grime. 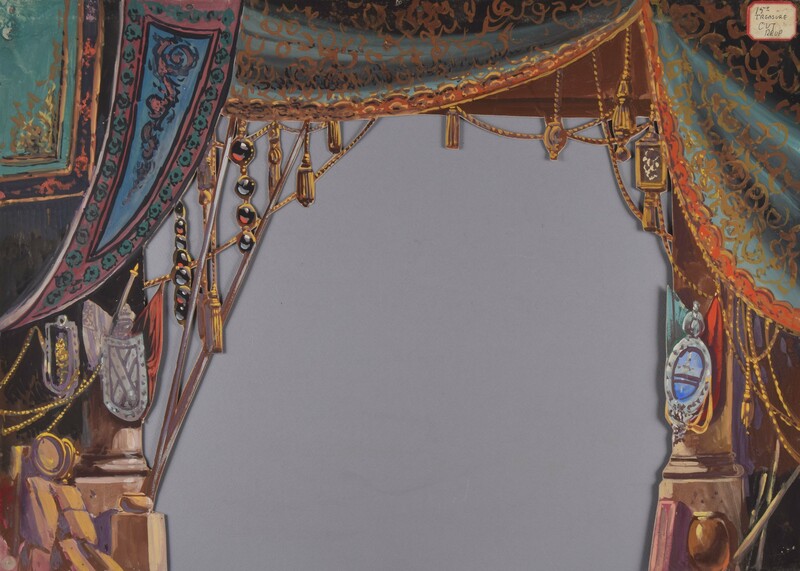 In the summer of 2014, paper conservation intern Rémy Dreyfuss began a project to conserve this beautiful example of turn-of-the-century theater technology. To begin, Rémy surveyed the entire collection, taking note of the condition of and photographing each item. He created a database to organize the descriptive data, condition information, and treatments performed on each item. The database links each item’s description to its corresponding digital image. Rémy surface-cleaned each drop using a soft brush and dry rubber sponge. He secured the boards that had become detached from their slats. He did not use nails for the re-attachment, but instead used small gussets of Japanese paper adhered in place with wheat starch paste. The gussets allow attachment to the wooden slat without unwanted stress on the paperboard. Rémy mended breaks and tears, again with archival quality Japanese paper and wheat starch paste. Rémy also designed, along with Apryl Voskamp, Head of Preservation, a new storage system for the models. The updated storage allows better access to the materials, while minimizing risk of future damage. Though the drops will be stored in the new housing, the original travel trunk will remain a part of the collection. 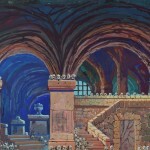 In addition to the drops, this collection includes a small-scale stage. The drops can be arranged here to show the dramatic effect of the layered elements of backdrop, cut drop, leg drop, and border. Rémy completed his project by photographing the groups of drops in place on the stage, as they would be viewed during a performance. Until now, these materials were almost inaccessible to curators and researchers because of their unstable condition. With the conservation treatment completed, the miniature scenery can be handled safely and made available for research. As a final note, the Ransom Center is only a few blocks from a Scottish Rite Theater on West 18th Street in Austin. 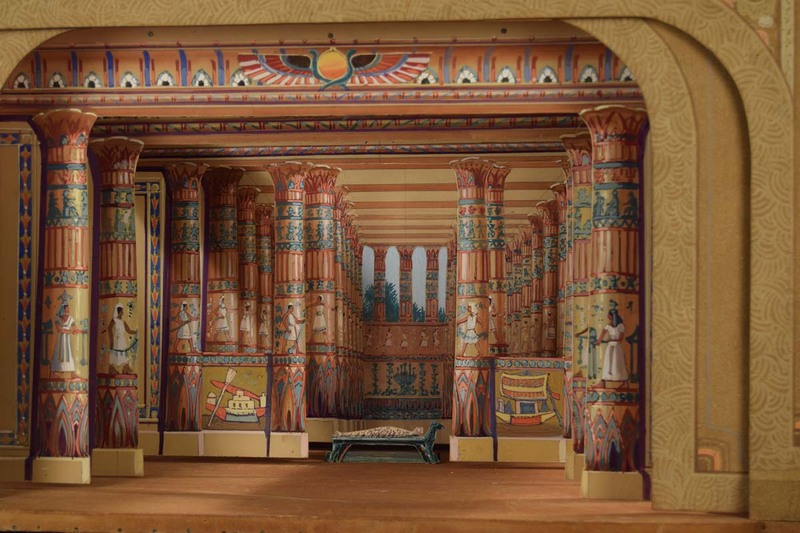 The theater houses, and still uses, an original collection of Sosman & Landis stage drops, the full-sized drops that the Ransom Center models represent. 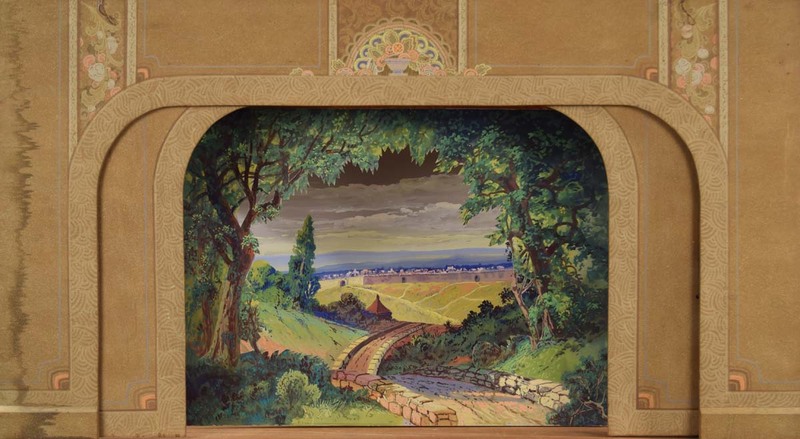 The Center’s conservation staff visited the theater to view the stage scenery and to get a backstage tour of the scenery collection and how it is used during performances. 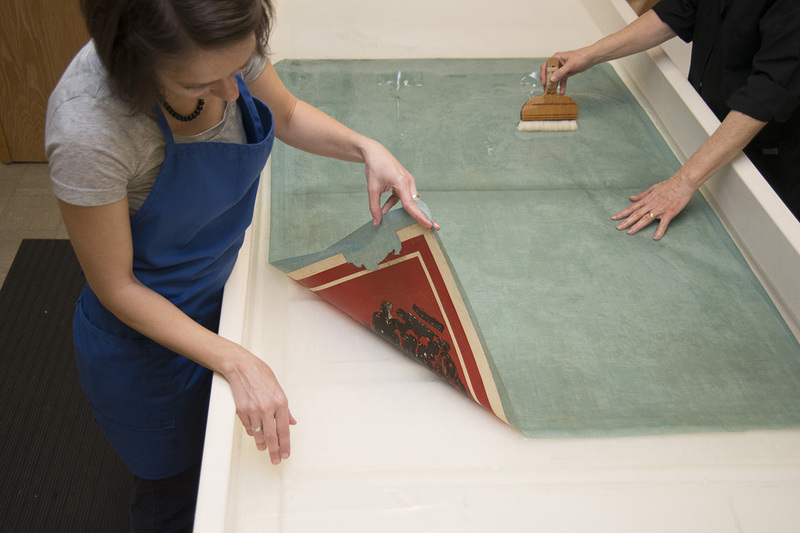 The poster came to the paper conservation lab having been lined in the past with a heavy, blue, starch-filled cloth, much like that used for binding books. This inappropriate fabric lining was noticeably wrinkled, and the blue color accentuated a large loss near the upper right corner of the poster. We made the decision to remove this lining and flatten the cockled poster. We also decided to fill the loss with a toned paper to make this area less distracting to the viewer. 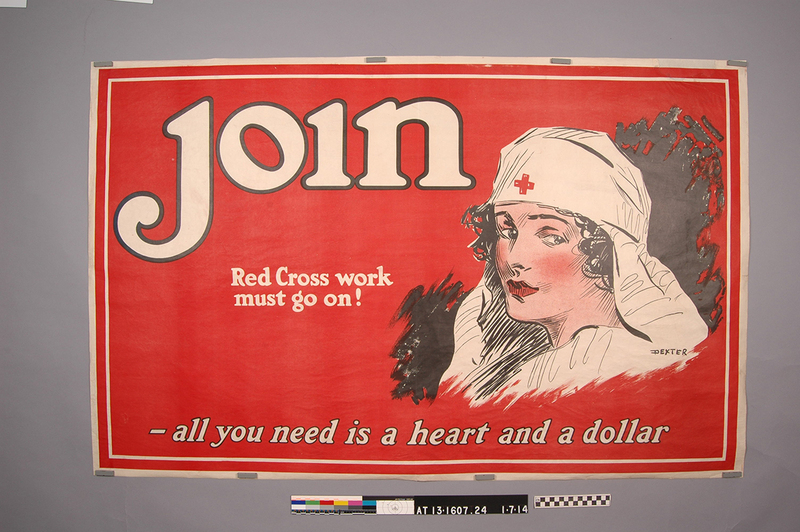 First, we surface cleaned the poster using a large, soft brush to remove loose dust and dirt. We continued cleaning the surface grime with rubber sponges, sometimes referred to as “soot sponges.” To remove the lining fabric, we needed to bathe the poster, which would loosen the lining adhesive and allow us to gently peel back the fabric. We tested all of the inks to ensure that they would not be sensitive to water, and we then pre-humidified the print and bathed it in deionized water at a neutral pH. 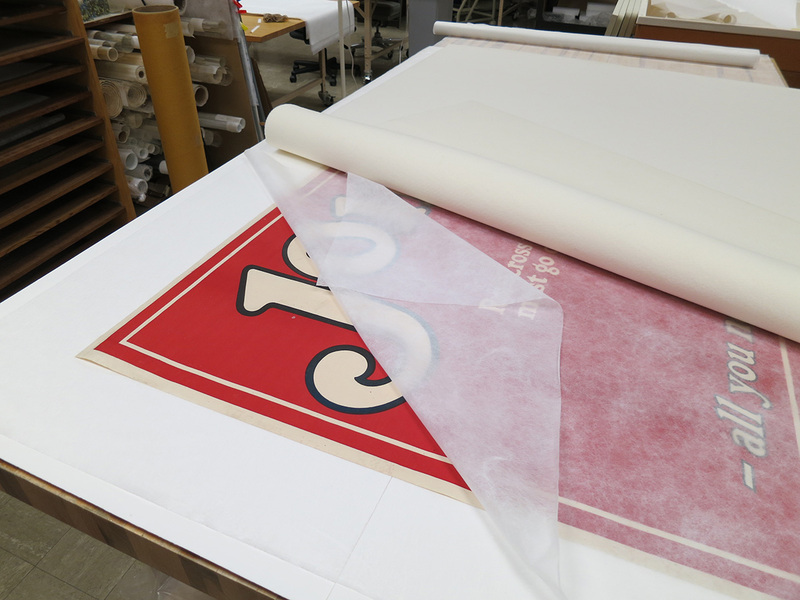 The adhesive began to soften within only a few minutes, and we were able to separate the lining from the poster. While the poster was still in the water bath, verso upward, we could feel that there was still adhesive clinging to the back of the paper. We used wads of cotton to swab off this residual adhesive. We exchanged the water bath two times until we were confident that we had cleaned it as well as we could. Next, we lifted the wet poster out of the bath. Handling wet paper is not difficult because we include a layer of spun polyester—called Reemay—on both the front and back of an item when we bathe it. The Reemay acts as a support during the bath and afterwards, when transporting the wet paper. 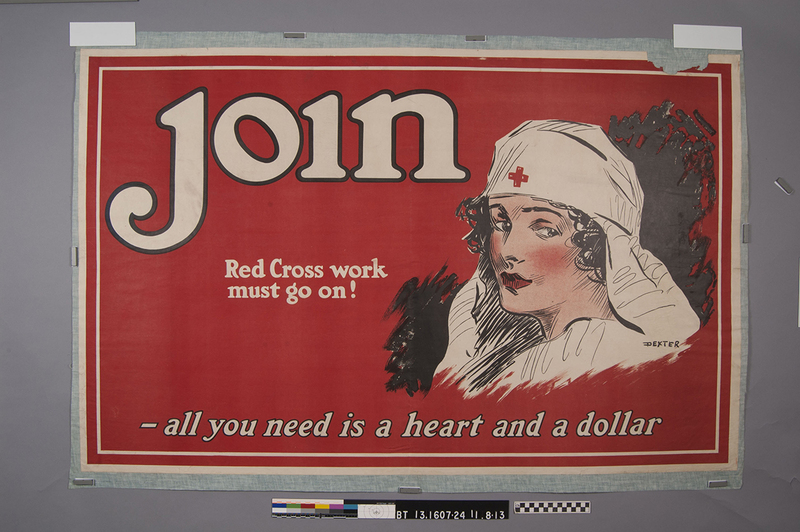 The poster was allowed to dry flat between layers of Reemay and blotters, under weight. About a week later, we removed the poster from under the weight and began work on the fill. 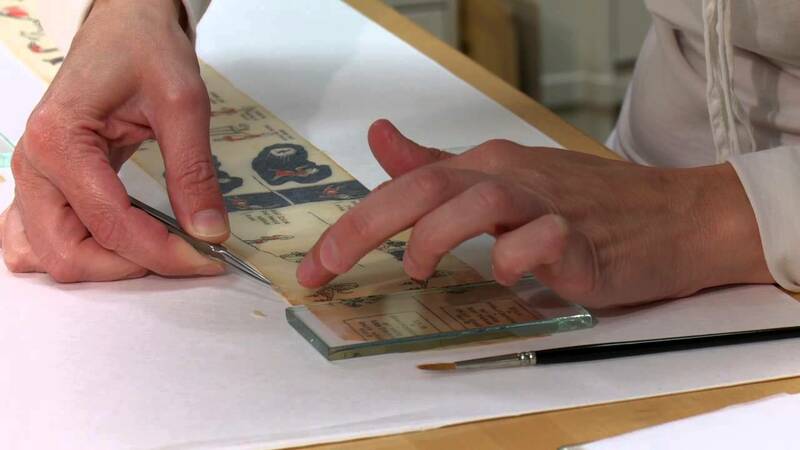 In paper conservation, Japanese paper is often used to fill losses. This strong, thin paper works well for repairing or filling losses and can be toned to a suitable color. 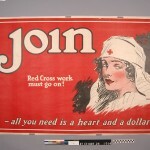 The poster’s missing portion covered both red and off-white sections. We toned a Japanese paper with red acrylic paint and layered this over an off-white Japanese paper. The fill was then shaped to fit the loss and adhered in place with wheat starch paste. 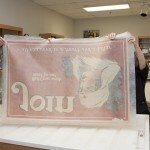 Again, the poster was placed between Reemay and blotter, under weight to ensure that the fill would dry flat. Once the poster was completely dried, the fill was trimmed along the outside edge. This treatment was unusual only in that the poster is so large. 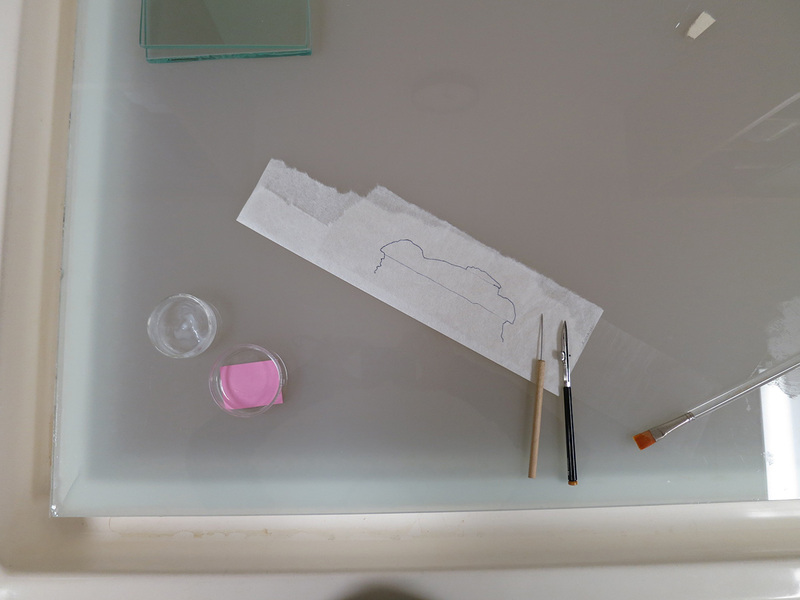 Otherwise, the techniques described here are common treatments in paper conservation. Before treatment: the poster is lined with a blue cloth. 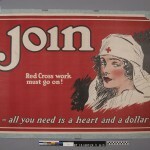 The poster is wrinkled and has a large loss near the upper right corner. Photo by Heather Hamilton. 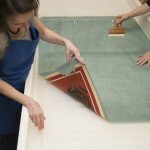 Conservators placing the lined poster into a large bath of deionized water. Here we see the back of the lining and one corner of the front of the poster. Photo by Pete Smith. 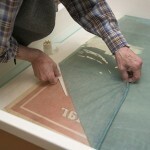 Jim Stroud pulls back the lining fabric while holding the poster securely with a tool. Photo by Pete Smith. 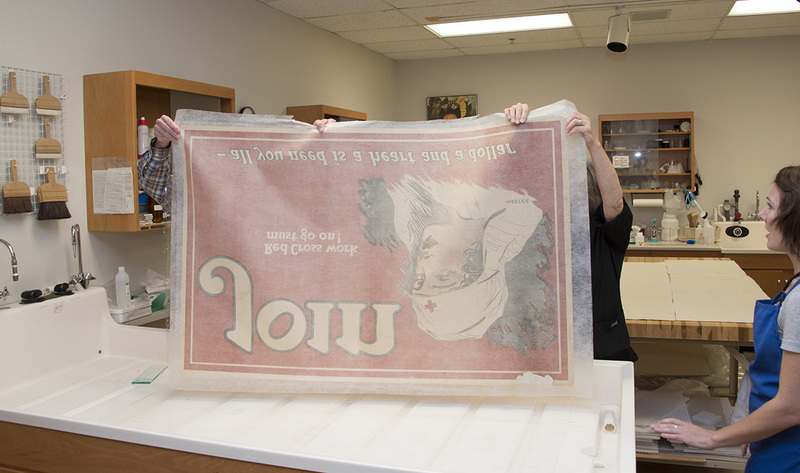 Conservators remove the poster from the bath. They are able to handle the wet paper because it is layered between strong sheets of spun polyester, called Reemay. The poster clings to the Reemay as it is pulled from the water. Photo by Pete Smith. After bathing, the poster is placed between layers of spun polyester and wool felts to allow it to dry flat. A rigid board is laid over the felts and weights are added. It will stay this way for about a week. Photo by Heather Hamilton. Filling the loss with toned Japanese paper torn to shape. The fill is applied to the back of the poster with wheat starch paste. Photo by Heather Hamilton. 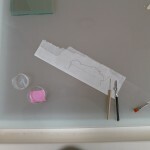 Tools used for preparing the fill. 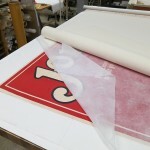 Mylar with an outline of the loss, Japanese paper to be cut to size, a water pen to help tear the paper with a soft edge, wheat starch paste to adhere the fill in place. Photo by Heather Hamilton. The fill completed. Photo by Heather Hamilton. After treatment. Photo by Heather Hamilton.